The demonstration was developed by the supply chain organisation in collaboration with the Open Mobile Alliance (OMA) and Swiss Research Institute, Icare, and is the latest step in their joint quest to bring barcode scanning capabilities to mobile devices. 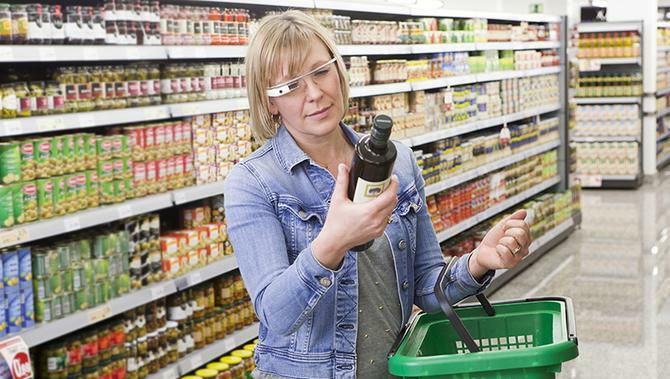 Using Google Glass, GS1 showed an individual scanning a barcode on product packaging to access a range of product information such as nutritional content and recipes. This content can then be adapted to personalised preferences, provide special offers, consumer reviews and shared with others on social media channels. The capability is yet another sign of the significance of wearable computing on a marketer’s ability to interact with and understand consumers. Where is wearable technology heading this year? In a statement, GS1 pointed out it had developed a number of data sharing services to allow brands and retailers to share accurate information about their products digitally. These services give app developers and the mobile industry access to the data they need to make innovations such as Google Glass, it claimed. GS1 and the OMA have been working together since 2011 to make barcode scanning a reality on mobile devices. Later this year, they plan to launch a specification based on existing standards that mobile device manufacturers can use to integrate barcode scanning features and link to product information in their apps. “If we can inspire the mobile ecosystem to see the possibilities for implementing the specifications we are developing, then this will be an exciting proposition for consumers,” Palazzolo said. GS1 hopes to see these as library components on all Android and IOS devices, she added. “GS1 and OMA standards are critical in enabling this vision of the connected consumer of the future, whose shopping trip and product usage are augmented with trusted information and services,” OMA board chairman, Gary K. Jones, continued. GS1 is a not-for-profit organisation that manages the system of product bar codes used by more than 1 million companies globally.